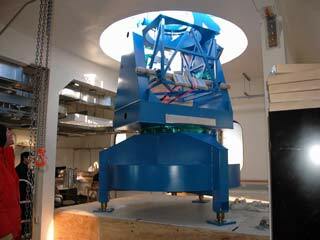 After years of sitting empty and incomplete...the Dark Sector Laboratory finally was to get its first science project...the BICEP submillimeter telescope. 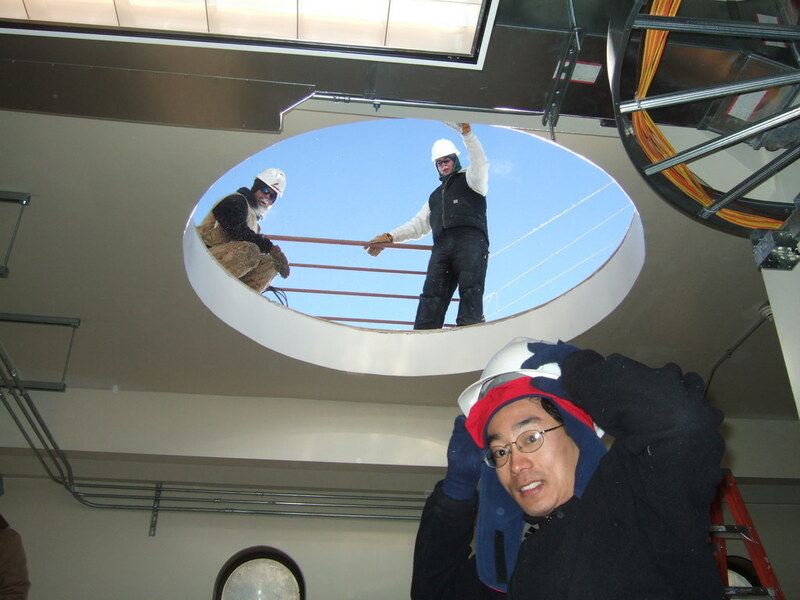 The project team was led by Caltech, UC Berkeley, and UCSD, with additional participation by institutions in France and the UK (list of collaborators). Briefly, the instrument was designed to measure the polarization of the cosmic microwave background (CMB) to unprecedented precision, and in turn answer crucial questions about the beginnings of the Universe (technical links are at the end of these pages). 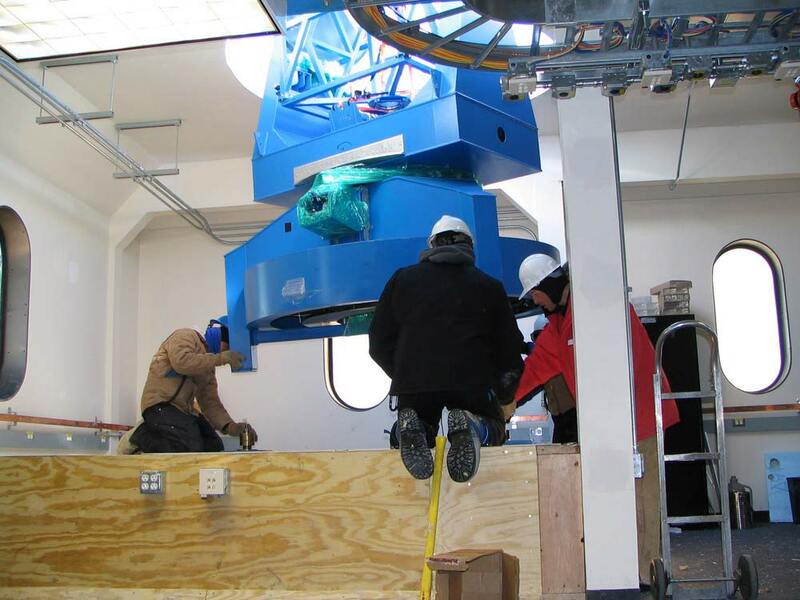 Anyway...before any of the science equipment had to be installed, there were some preliminaries...such as the punch list for conditional occupancy of the building, as well as some structural modifications for the project. 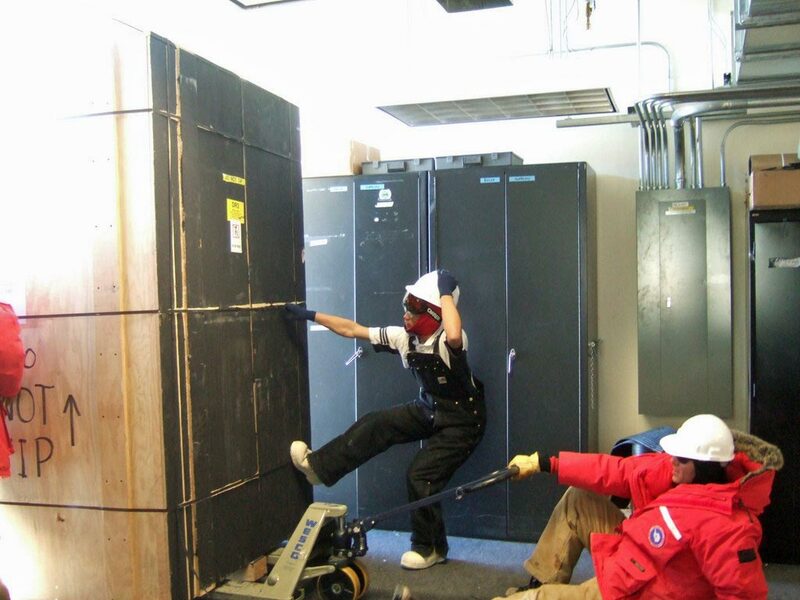 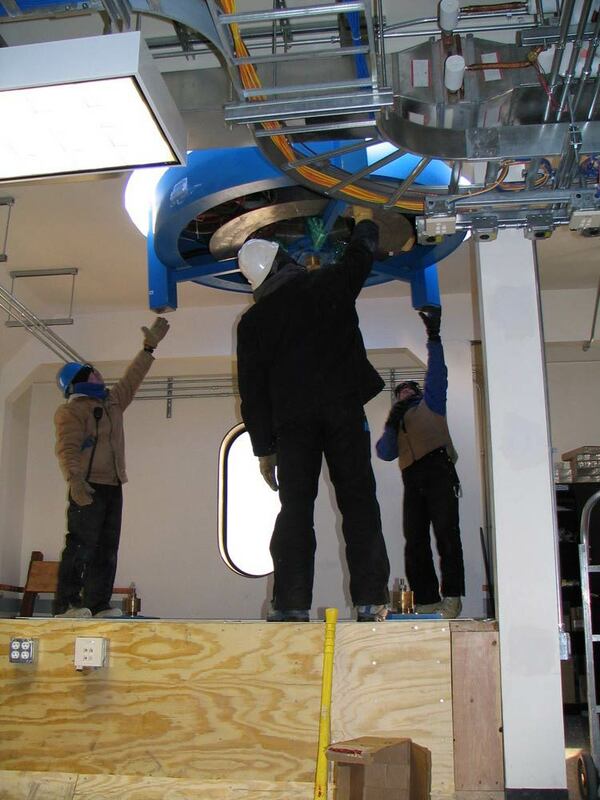 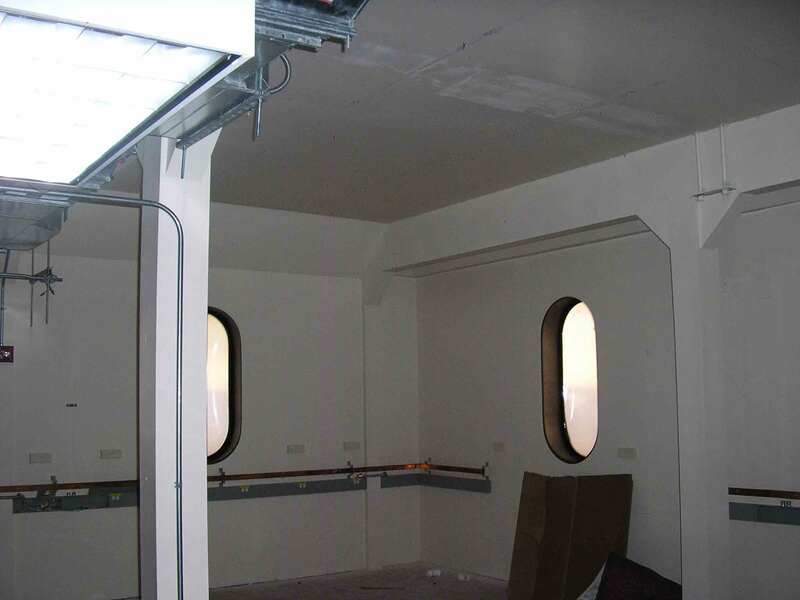 During the 2005 winter, upgrades and repairs to the DSL heating system were made...as well as clearing away the glycol piping, heaters, and electrical fixtures from upstairs northeast corner room where the telescope was to be installed. 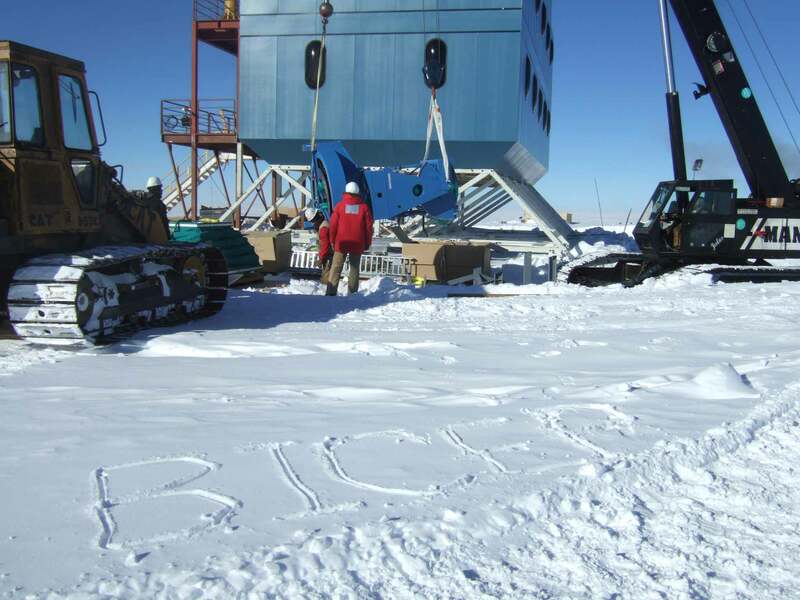 I took this photo in September. Next, we cut the rough hole for the telescope mount. Meanwhile, the raised telescope platform was constructed under the hole. Conditional occupancy (allowing the science team to get to work) didn't happen until 20 November, after some of the exterior platform work was completed and additional electrical and mechanical was installed that we didn't have during the winter. 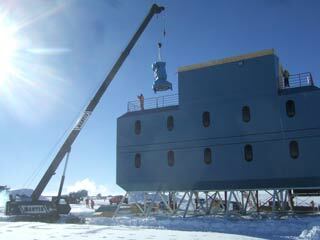 Anyway, one of the first things to happen was the installation of the heavy (1300 lb) steel base plate. 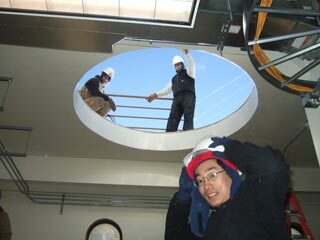 Here underneath is Yuki Takahashi (YT). Here comes the base plate (YT). 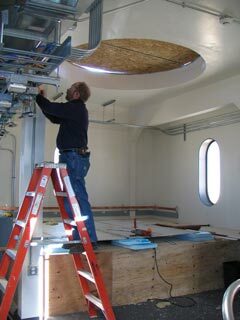 The plate is in place on the pedestal...but not quite, as electrician Phil does a bit more wiring (CC). Some of the BICEP cargo being staged outside of DSL (YT). Moving the cryostat crate inside (YT). Unpacking the cryostat crate (CC). 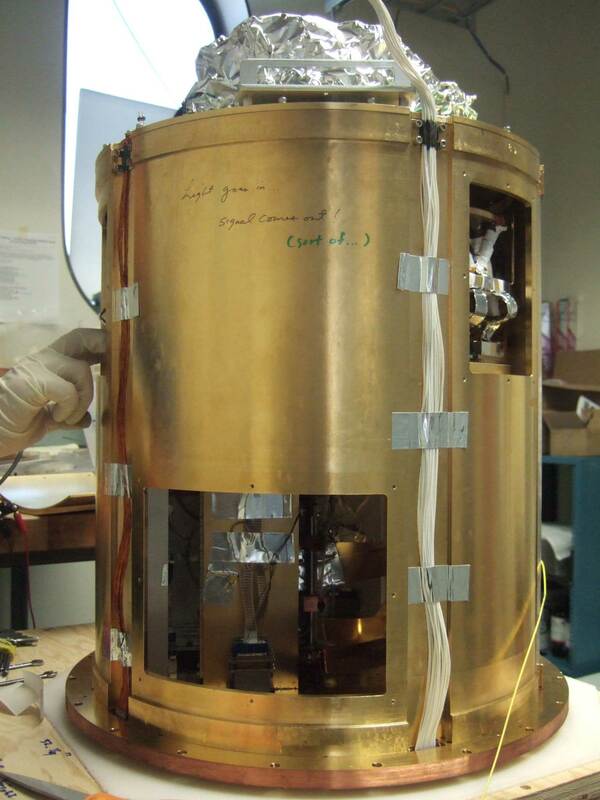 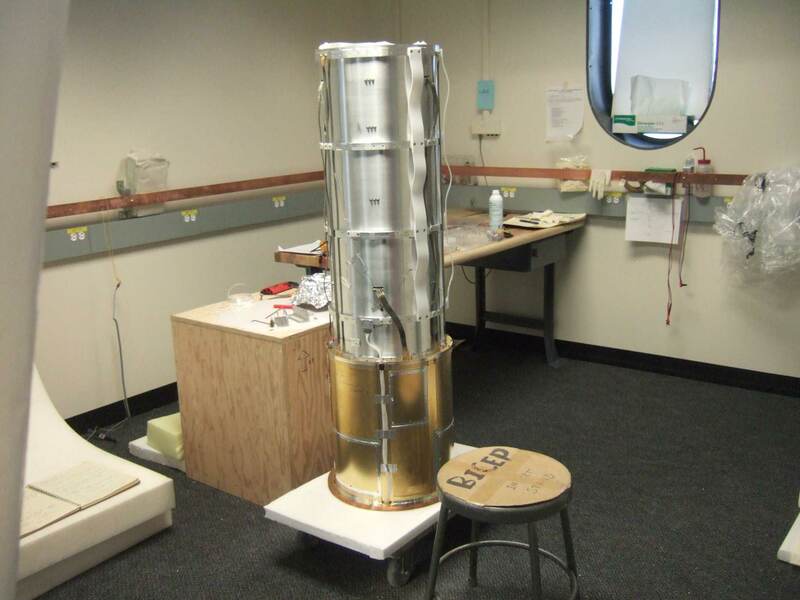 The telescope insert, the heart of the instrument (YT) (APL). 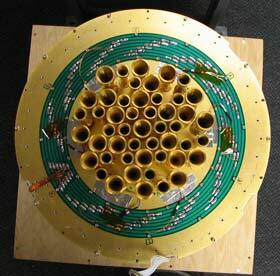 The focal plane on top of the insert--what Cynthia called "a CMB photon's view of the focal plane" (CC). 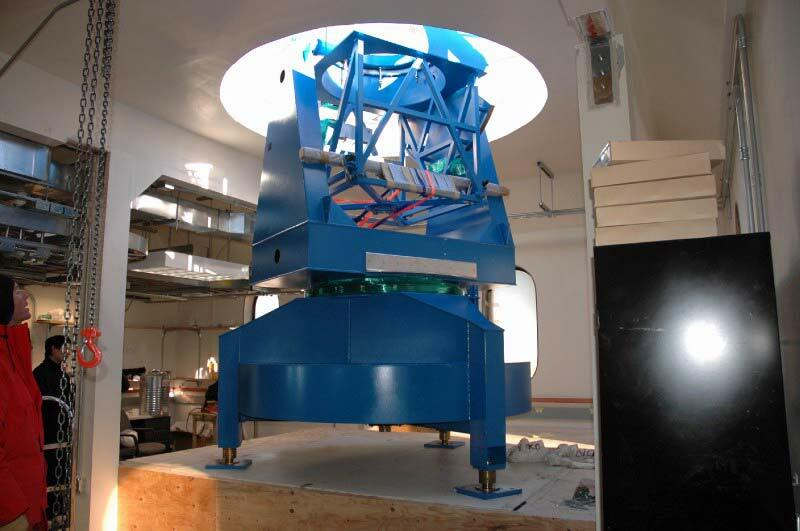 A bit later, the refractive optics was bolted to the top if the focal plane (YT) (APL). 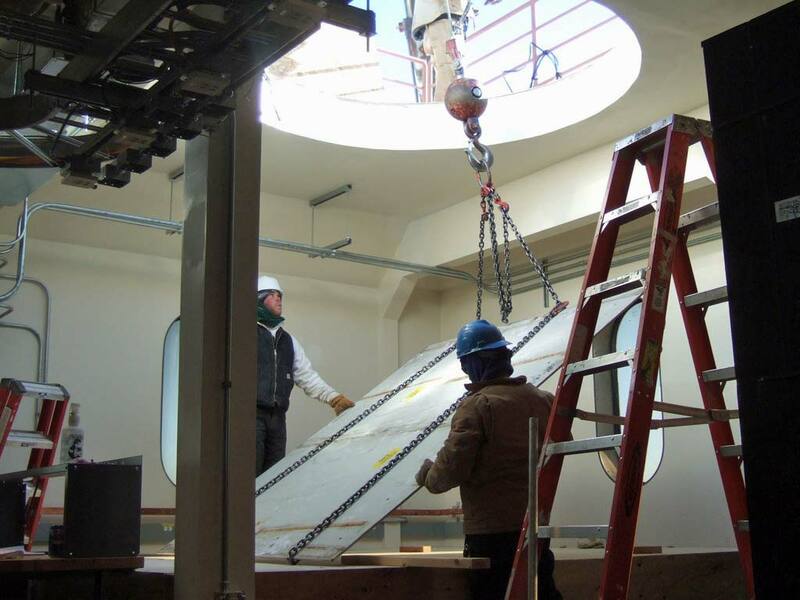 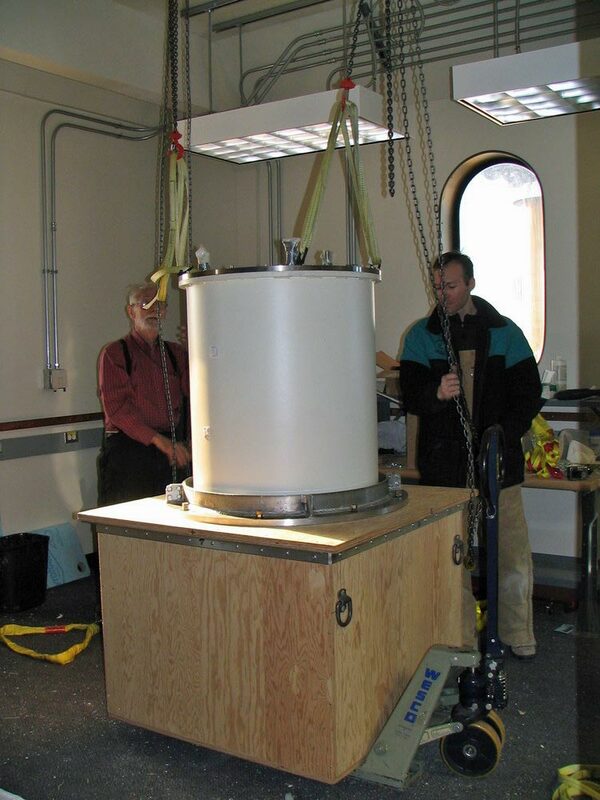 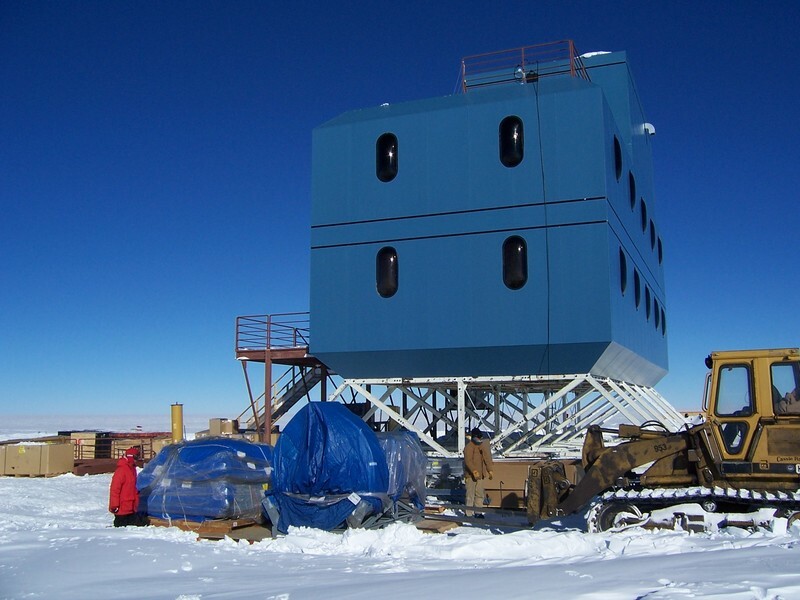 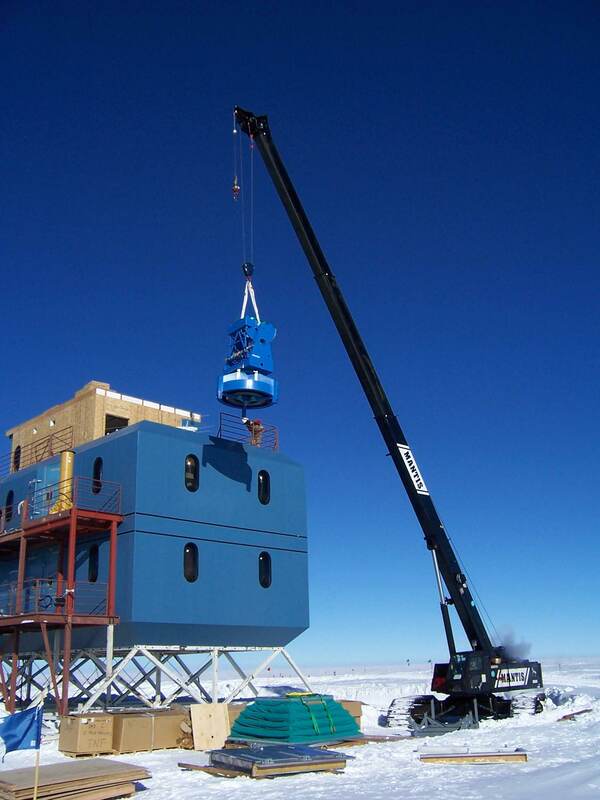 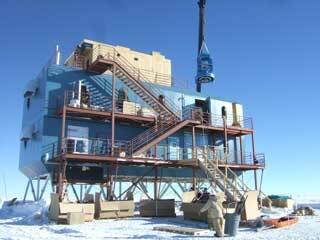 30 November 2005, the telescope mount was lifted into the building (YT) (APL). 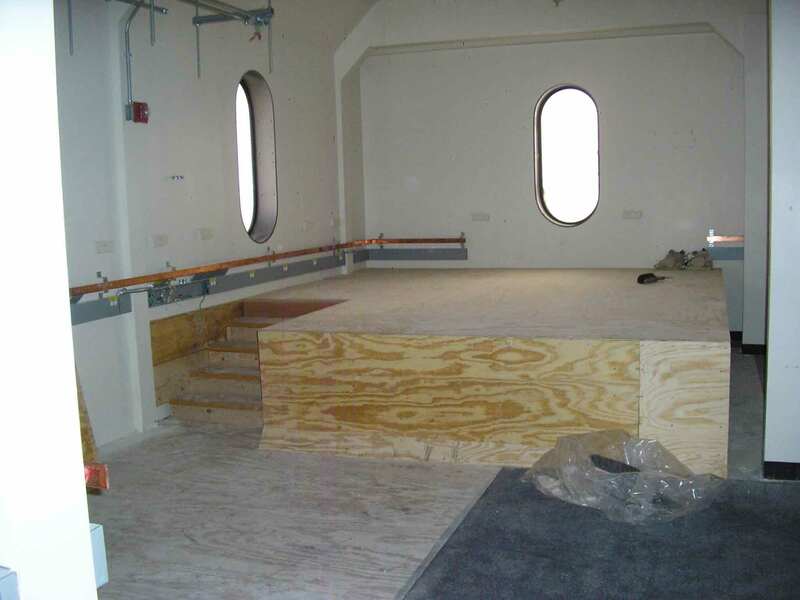 A view from the east end of the building (JK) (APL). 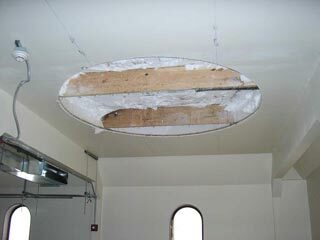 Lowering the mount through the roof opening (CC). Lowering the mount and positioning the feet (CC). And the placement is complete! (KWY). 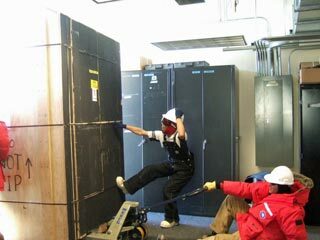 Time for the hero shots! From L to R: Pete Mason ('51 BS Ph, '52 MS ME, '62 PhD EE), CalTech visiting physics associate; Ki Won Yoon, Caltech graduate student; John Kovac, Caltech postdoc, Cynthia Chiang, Caltech grad student; and Yuki Takahashi ('01 BS Ph). 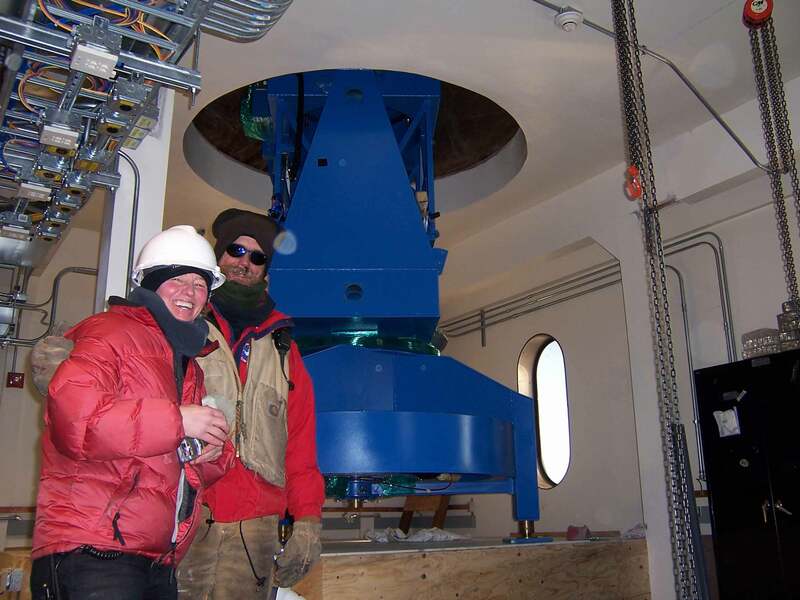 On the telescope in the background, Evan Bierman, graduate student at UC San Diego (CC). 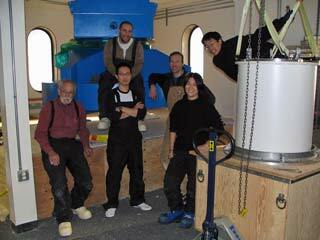 And a couple more folks...B.K. Grant, SP area director, with FEMC manager Carlton Walker (JK) (APL). 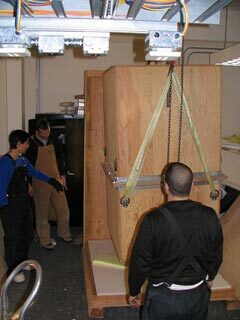 Among other remaining tasks...finishing the unpacking of the cryostat (CC).